Although I am not sure of the exact reasoning behind this statement, it must surely have something to do with the difficulties in germinating the seed. 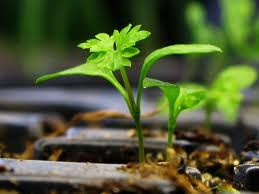 If you do manage to successfully germinate parsley seed, then there is another problem just waiting around the corner because parsley does not cope well with being transplanted. However by sowing parsley seed either straight into plug trays, or directly outdoors into prepared seedbeds, at least one of these obstacles can be avoided. 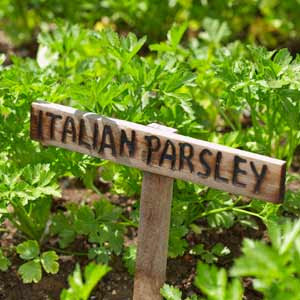 When growing indoors, the key to successful parsley is to give the seed a certain amount of heat treatment. You can either soak the seed overnight in warm water or supply basal heat to the sown plug trays using a soil warming cable. Fill a plug tray with good quality seed compost, then tap it down lightly, pressing the surface to make it flat. Water the seed tray before sowing, then allow it to drain thoroughly. When ready, thinly sow the parsley seed over the of the compost and then cover with vermiculite to a depth of 2 mm. Cover the plug tray with a sheet of glass, Perspex or cling-film to keep the moisture in, then place a sheet of paper over the top to keep direct sun off the seed. Place the tray onto a warm windowsill or – if you are lucky enough - in a thermostatically controlled propagator set at a temperature of about 20 degrees Celsius. As soon as the new seedlings start to show, remove the cover. Once the seedlings have emerged - this can be any time from 3 and 8 weeks - water regularly and in addition, give them a good quality liquid feed such as a seaweed extract once a week. Without sufficient water the parsley can flower within its first season reducing its foliage growth. Cutting out the emerging flowering stalks will help with this but it is not ideal solution. When the seedlings have grown their second pair of ‘true’ leaves, they can be pricked out leaving one strong seedling per plug. Two to three weeks later you can then transplant three plugs into one 9cm clean plastic pots in the same growing medium as used for sowing. From this point onwards, treat each pot as one plant. When harvesting the leaves, take them from around the outside of the plants. 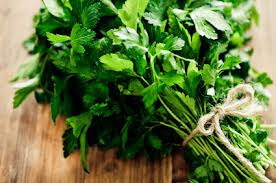 Parsley is not a good herb for drying as it will quickly lose its flavour, so either use it fresh, or keep in a plastic bag for storing in the freezer.